The Euro gained yesterday but gave some of it back at the end of the trading session, as European data was mixed yet overall discouraging, confirming the economic slowdown in the Union as Germany's GDP showed zero growth in the last quarter. For the whole EU, growth reached 0.3% in the three months to December, better than the 0.2% expected. US figures were quite disappointing as well, causing the US Dollar to loose momentum. Retail Sales were down by 1.2% in December, missing the market's expectation of 0.2%, while the core reading declined 1.7% vs. a 0.4% increase expected. The Euro’s outlook remains bearish for today, as traders await minor releases from the EU and the US; December Trade Balance, January Industrial Production, and the Michigan Consumer Sentiment Index for February could cause some swings the market. The Euro bulls tried to break above 1.13 (R1) yesterday, but the bears took back control as price is currently trading at 1.1284. 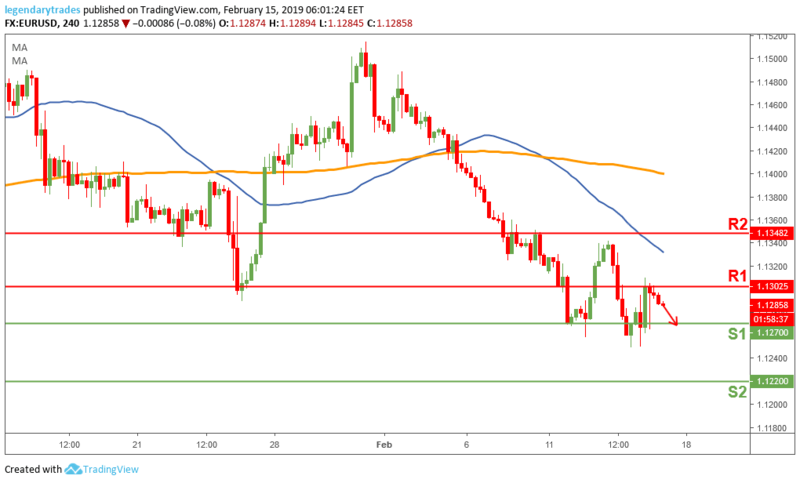 The sellers’ current goal is to try and break below 1.1270 -1.1250 to attract more downside momentum towards 1.1220 (S2). A successful break above 1.13, could stop the bears’ dominance in short-term.